Each player MUST have a Festival of Legends 2019 entry pass, which is NOT included with Myth Quest and must be purchased separately. Will you overcome challenges, defeat monsters, solve riddles, and return triumphant with tales of glory that will pass into legend? and discover your own Myth Quest! 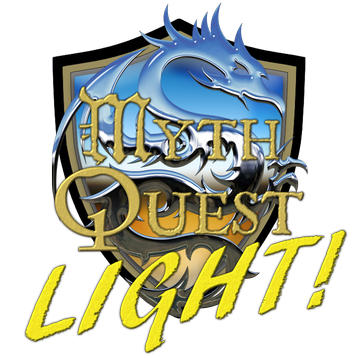 Myth Quest LIGHT! is a team-based non-contact fantasy live action role playing game that blends real world locations with your imagination! Preview the rules and available classes HERE! and must be purchased separately. You can get yours HERE! For adult players 13+. Up to six (6) adult players maximum may play on one team. Players under 18 MUST be accompanied by a ticket-holding parent or legal guardian. Please plan to arrive fifteen minutes prior to the start time listed on your ticket. Each ticketed event takes approximately one hour to complete. No refunds, exchanges, or rescheduling. All players will be required to sign a waiver prior to playing. Players 17 and under will require the signature of a ticket-holding parent or legal guardian. Regarding children 5-12 years of age who wish to play: DO NOT purchase a Myth Quest adult ticket for them. They will instead require a Merlin's Apprentice ticket, which unlocks a unique class for them to play and includes a special Merlin's Apprentice pouch and gemstones for them to keep. Merlin's Apprentices do not count towards the six players per team limit. Sorry, but no players under the age of 5 allowed.